This is one of the most important lessons for investors when they are reading Wall Street research. Most of what is presented is explanation of what is going on the market. There analysis is presenting of facts and an explanation of what those facts may mean relative to past information or other facts. However explaining is not telling stories of correlation as causality. Often researchers look at correlation as causality and thus an "explanation".This is where the trouble with analysts begin. This is not prediction and it is not good analysis. Providing facts in a structured manner is useful; however, it is often not colorful and will not earn an analyst the big bucks. The status from making forecasts is why analysts get into the prediction game but it is at the expense of investors because most analysts get it wrong. There are analysts who are good at explaining, but predicting is a whole different story. Explainers are not always good forecasters. Investors should never confuse the two. Reading research is useful to give context but context is not always the road predictive power. The confusion between explaining and predicting can be eliminated through the use of models. The quality of a model is not based on the glibness of a speaker or their style of writing. The success of a model is based on whether it works. It is measurable prediction. Great simple quote on the fact that we have to always be set for surprises. What is a good environment today may change radically tomorrow. We can and will be surprised. A large amount of risks occur when the markets are closed for a given region. The close to open risk can be as large or larger than the behavior from open to close. However, this does not mean that we should avoid taking risks. What it does mean is that making sure you are diversified at all times is the number one risk management solution. Ensure that on any day a surprise will not destroy your portfolio. I think one of the best risk approaches is through volatility management not position exposure management. Risk parity provides one of the best diversification solutions especially when the risk budget is divided across factors. A portfolio manager can allow for tilts in the risk budget but the null of equalization is a good starting place when there is no information advantage. The VIX index of option volatility has been often referred to as a market fear index. Some also use this as an uncertainty index. Investors will use these terms interchangeably, but the wording is not precise. The VIX index is the weighted average of option volatility for actual stock prices while market uncertainty may be better represented by the dispersion of opinions across investors. We can use an actual measure of uncertainty with the Economic Policy Uncertainty index which collects information on forecast dispersion and news stories on uncertainty. 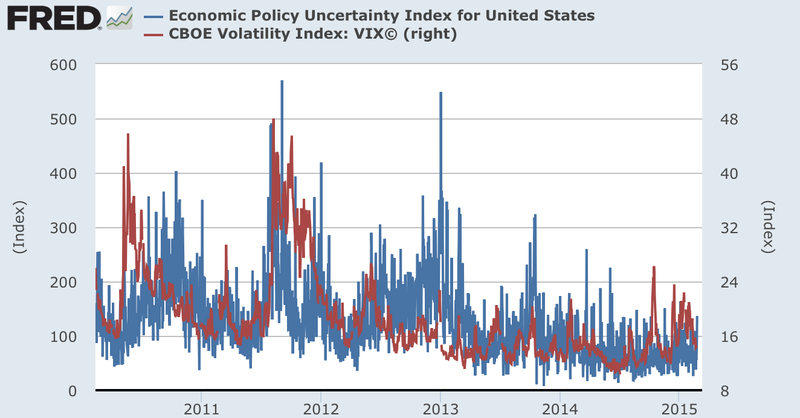 If we compare the VIX as a fear index and the economic policy uncertainty index, we can see that they are not always tracking the same thing. Look at the long-run in the top chart and you can see there is a close relationship but there are also clear divergences. Fear came before uncertainty in 2010. In 2013, there was an increase in uncertainty but no fear. 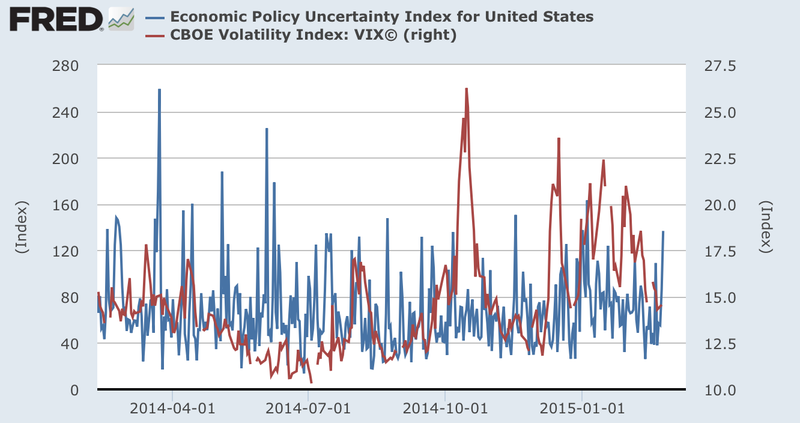 Over the last year we had a spike in the October VIX reading, but no change in uncertainty. In the summer there was an increase in uncertainty but no change in the fear index. To get an idea of market stress or ambiguity both these measures are useful. The economic policy uncertainty index began as a research project by some research professors but has grown into something much more than a historical analysis. The index is based on three part: news on policy uncertainty from leading newspapers, temporary changes in the tax code, and dispersion of economic forecasts. It provides a good approximation of economic uncertainty or ambiguity that can be measured systematically through time. 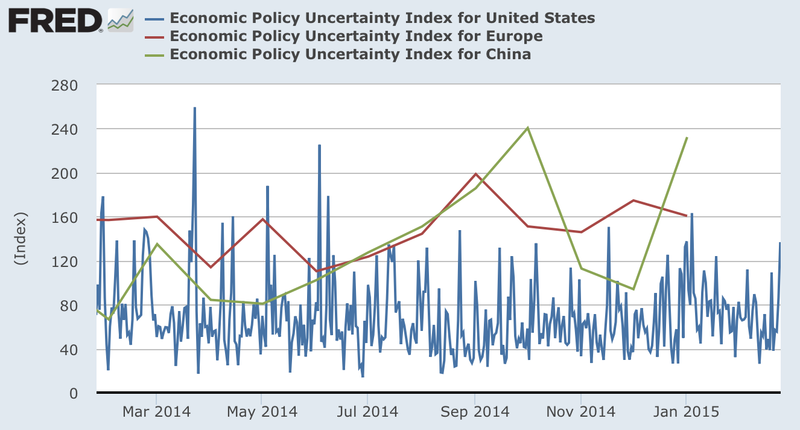 The index has been expanded across regions, so, for example we can look at the US, Europe and China to measure relative uncertainty. The top graph shows the level of uncertainty over the last year. 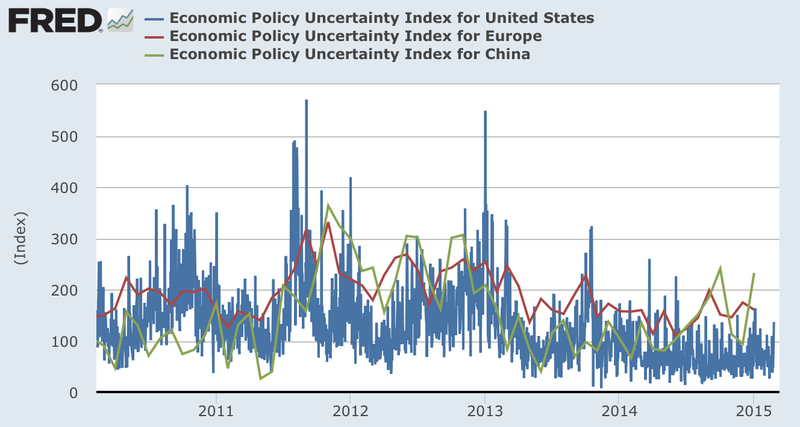 Europe has been higher than the US, but there has been increasing policy uncertainty in China. Both Europe and China are measured on a monthly basis while the US is measured daily. We kept the US data daily to provide an idea of how rough the data can be on any day. Clearly, the US has shown less uncertainty over the last year, but that has not been the case over longer periods. Over the last five years, we have seen the relative uncertainty switch between regions. The US has spiked during budget crises while China has been the least uncertain for the last five year period. We can say that the relatively low level of policy uncertainty currently may have made the US a safer haven for investing. The stock market has been going higher, yet there is always talk about financial risk in the economy. Talk is cheap. Data can tell us the real story. There are a number of indices available from Federal Reserve Banks which can provide insight on the financial risks or stresses in the current economy through a number of market-based measures. We think that these indices are a much better way of framing any discussion concerning financial crisis risk and can represent a more focused discussion on where the current economy is headed. Using these indices is consistent with our disciplined and systematic approach to investing. Let's not talk about our feelings concerning financial risk, but speak about relative measure through time of variables that are associated with financial stresses. 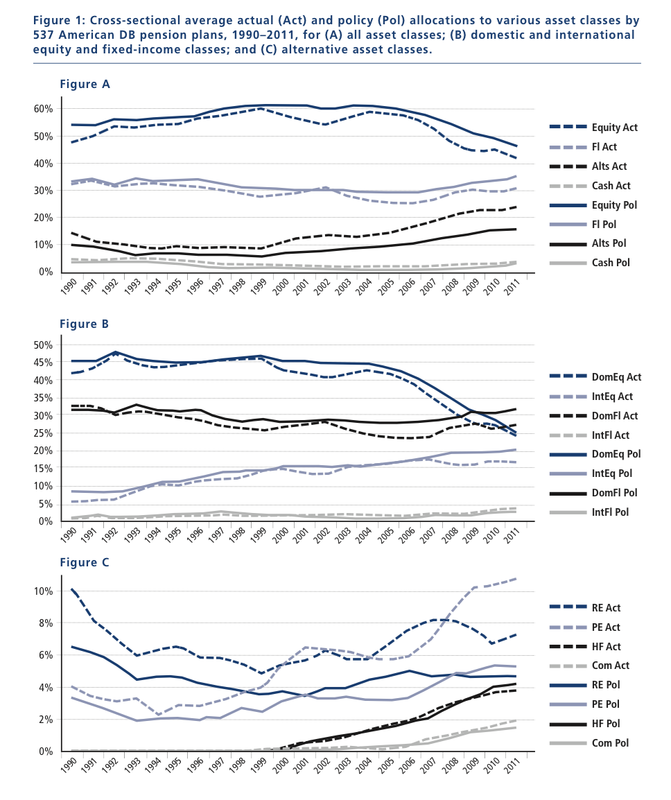 We still have a lot to learn about the links between financial measure and crises. 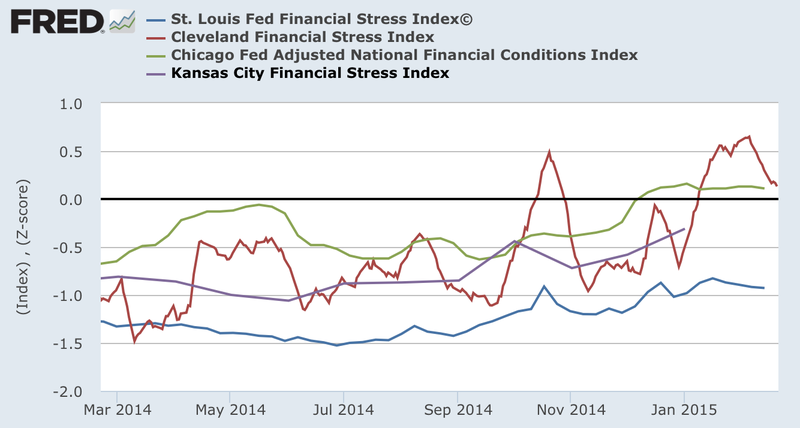 The correlation between any one Fed financial risk indices are highly variable and not much stronger than what we have found by looking at the VIX index alone, but when looked as a group, the stress indices provides useful information. 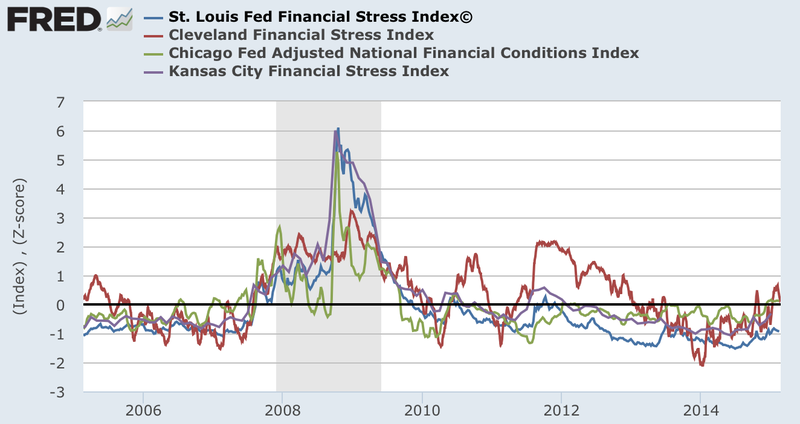 The first chart shows that since September financial stress has been moving up with all of the indices. All saw a spike in October albeit to different degrees. The Cleveland index is the most volatile and will also show the most noise. The Kansas City index is produced monthly and will be a much smoother than the other series. The five year post-Financial Crisis data shows we have had two major stress points in the post-crisis period, fall of 2010 and fall of 2011. 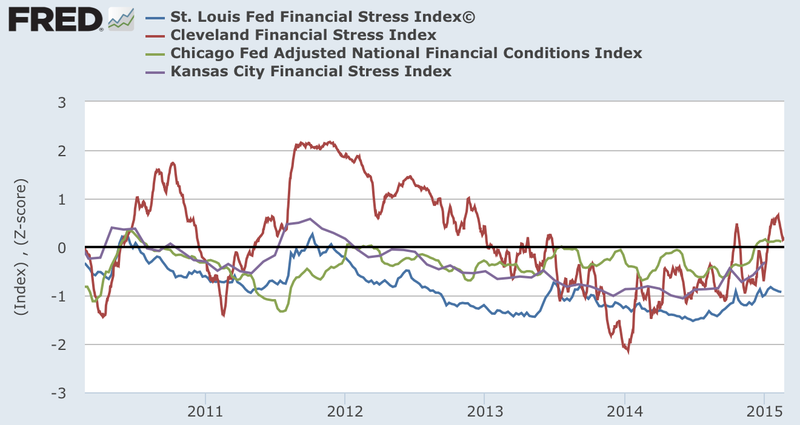 The Chicago and Cleveland stress readings are at the highest levels in years. The long-term numbers are all skewed by the Great Financial Crisis. The economy is nowhere near those levels and are away from higher levels seen four years ago. It would be premature to suggest that these indices are pointing to a recession, but the numbers do provide a reason for why the Fed is still interested in patience and can explain some of the talk that the economy is not rosy. The death of investment management skill? Between talk of shrinking alpha and the death of investment skill, it has been a bad month for active managers. It has only gotten worse if you look at some of their performance numbers for the first part of the this year. The story has has creditability when you review investment flows. The move to passive indices has continued at the expense of active managers. The long-term argument is that if there is more money in passive investments, the active managers will have more opportunities to generate return, but that argument is not exactly true. The reason is based on the "paradox of skill". If the number of skill managers either increases or stays the same relative to the amount of money managed, the alpha gain should be less. More skill players are chasing the same opportunities. Skill is valued on a relative not an absolute basis. The quality of money management has increased based on education and training, but this skill is across the board. Managers are running faster to stay in the same relative space. We see this is sports. Runners have greater skill now than a generation or two ago. Runners have an absolute performance advantage over the past, but that does not mean any individual runner will win more races today. So what should investors do? One thing should be obvious. Don't expect to make money with managers who focus on, for example, large cap growth or value. There are too many of these managers looking for the same thing thus creating crowded trades. The traditional active stock bond mangers are in fields that is too crowded. The alternative is to focus on investment strategies that are more unique and less crowded. Strategies where there is greater dispersion in beliefs will by definition be less crowded and have the opportunity for higher returns based on skill. One of the key reasons we like global macro is that there is less agreement on fair value. Hence, alternative models that create even a small edge have a chance for success. 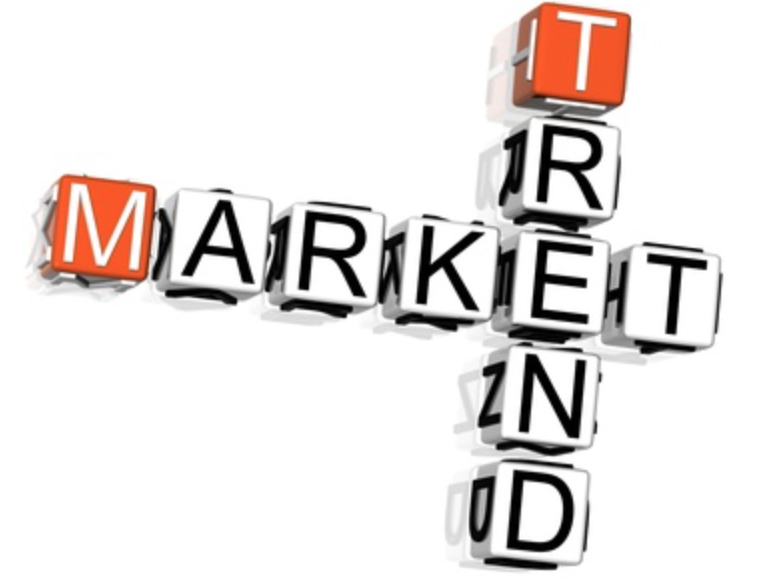 Trends exists in most markets and trend-following is an effective strategy to exploit the behavior in prices. The evidence for this behavior has been strong and momentum by some finance professors has been called the fourth factor to explain return. However, many still wonder what causes trends. We have looked back through much of the finance literature and have developed our own stories for trends and have a growing list of reasons. All do not work at the same time and each may have a different time length and strength, but all are creditable reasons for why trends exist in market. I break the rationale for trends into two major categories: economic and behavioral. The behavioral reasons are based on the actions of investors which will create under-reaction in prices. The economic reasons are based on the structure of the economy or markets and is unrelated to behavioral biases in investors. 1. There is wisdom in crowds - Evidence suggests that forecasts that are based on more than one point of view are valuable. Price action is another point of view and hence should be used with decision-making. 2. Following the herd - When an investor is at an information disadvantage or there is limited information, following the herd can be rational. The herd is the aggregated view embedded in market prices. 3. Under-reaction - Evidence suggests that markets under-react when there is a high degree of uncertainty. Market participants slow their response in the face of uncertainty. 4. Reaction to shocks - Markets face surprises but there may be frictions in markets which will lead to slow price reaction. This could be from spot activity, hedging, and transaction costs. 5. The limits to arbitrage - Arbitrage may be limited because there is a limit on capital, there are cash flows associated with arbitrage, there may be limits to knowledge and experience, and there may not be agreement on fair value. 6. Policy trends last for long periods - Monetary policy, for example, may be one directional for years which creates trends. 7. Economic trends last for long periods - Growth or pro-cyclical behavior can last for years. Recessions may be more short-lived but more extreme. 8. Markets follow cycles - This is especially true in commodities where supply cycles can last for quarters or years. These cycles can be independent of the business cycle. 9. Risk premia will follow economic cycles - Risk premia usually change slowly over time but follow trends that are counter-cyclical with business cycle. 10. Inelastic demand or supply - Price reaction will be larger over time because supply cannot be produced in short run or demand does not change for small changes in price. 11. Dispersion of beliefs - When there is greater dispersion of beliefs, there will be more trending. This is especially true of macro markets which have a hard time determining fair value. 12. Information uncertainty and drift - Prices will react slowly if there is poor information that is subject to errors and revisions. 13. Momentum and industrial growth - There has been a strong link between momentum in stocks and industrial or sector behavior. Similar markets move together and provide information on the sector. 14. Market state of over-confidence - There is more trending when there is a state of over-confidence on the overall economy. Macro behavior impacts micro expectations. 15. Price pressure effects - In the short run, there can be trends from hedging behavior and portfolio rebalancing. 16. Adaptive markets hypothesis - Andrew Lo developed this model based on evolution and competition within markets. 17. System neglect and regime change - Regime change or structural change is often not immediately noticed, so there can be trends around these periods. 18. Good and bad news reaction to surprise events - Tests have shown that markets under-react to good news and often over-react to bad news. 19. Behavior of small and noise traders - Markets may trend because of the behavior of marginal traders at different times. 1. the disposition effect - We hang onto our losers and sell winners within a portfolio. This will create trend behavior. 2. Conservatism - There is the slow update of information. 4. Analysts and herding behavior - Analysts will often herd with their forecasts being the same. 5. Investor distraction hypothesis - Distraction or neglect will often mean slow price reactions. There are more reasons for why trends exist and it makes sense to follow trends. I have just mentioned some without even talking about technical analysis or any specific mechanism for finding trends. I am sure that others could add to this list. 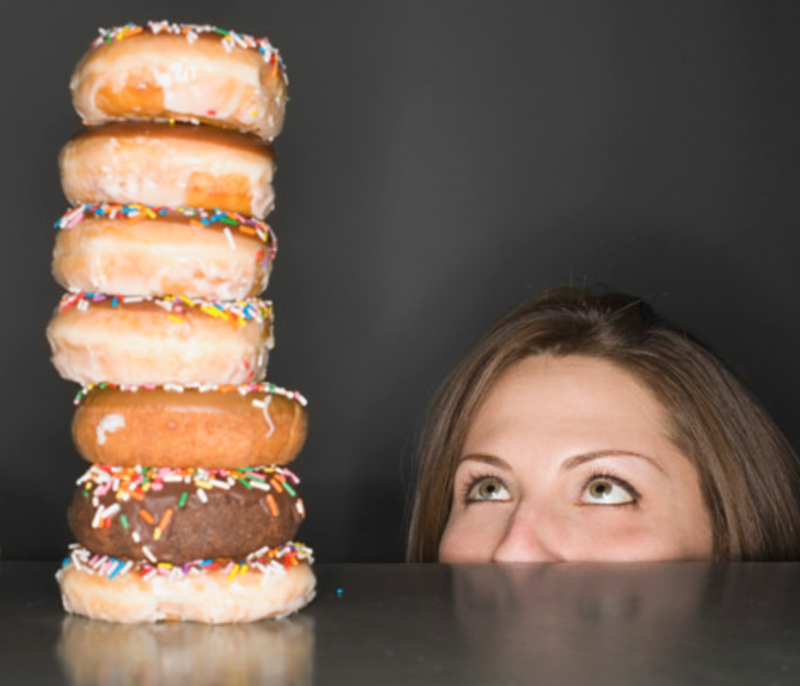 Can pensions be gluttons for trends? The evidence has been growing that markets have trends and there is a momentum effect, but the same research also shows that at longer-term horizons there is a reversal of any momentum effect. Mean reversion will occur so blindly following trends may be a problem. Investors should follow momentum, but over time the impact is diminished and an investors has to move on. The asset allocation process has to reviewed on a regular basis. This is one of the reasons why exit strategies for trend-following is critical. Pension funds may act too slowly to reverse a specific course of action. They adjust their strategic allocation over a long horizon which is based on momentum but the implementation and exit may result in acting too late. Invest based on the past, but realize that over a multi-year period, there will be a reversal. Like any trader, the exit strategy may drive performance. One of the simplest solutions is to have managed futures or global macro managers in the portfolio who will act much quicker than the pension fund. They should tactically capture the momentum across assets classes and then exit before a reversal. In a perfect world, the pension fund should focus on long-term allocations, while the manage should look for opportunistic gains based on more recent momentum. There has been an interesting discussion on how investing in commodities and currencies should be similar. This is an important insight because too often commodities have been discussed in the context of a long-only asset class which is a flawed approach, and currencies have been questioned as even an asset class. In fact, they should be considered asset classes that have special properties because they are consumed and used as a store of value. The argument is that commodities and currencies are similar asset classes in that they will move up and down based on the excess stock available relative to what is "consumed". When there is excess supply versus demand inventory will build which will lead to a lower price in order to clear the excess. We have to look beyond the fact that money is supplied by fiat and look at the determination of price based on imbalances between supply and demand through time. 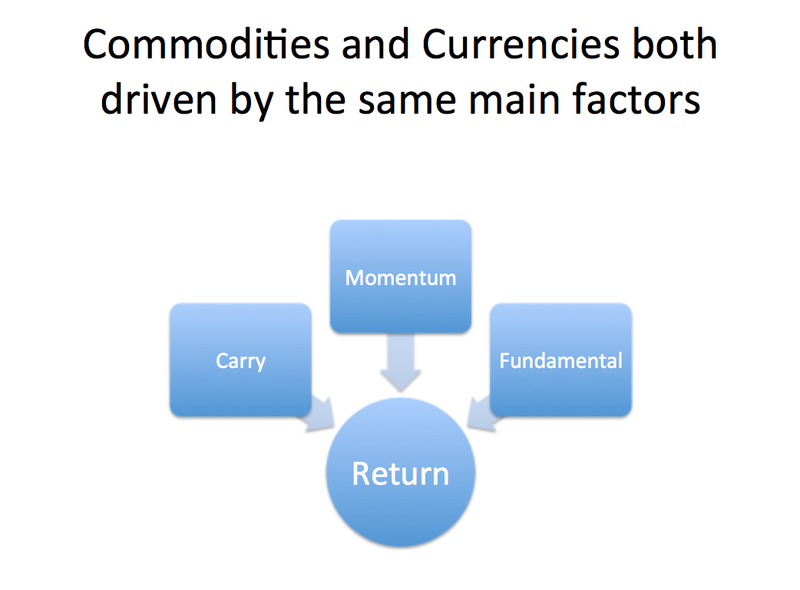 If we take this broad approach for both commodities and currencies, we can focus on the three drivers or factors that will affect each of these asset classes: carry, momentum, and fundamentals. There has been significant research work in the FX market to suggest that these three factors drive most of the variation in returns. The same can be said for commodities. In fact, investors can buy swaps which focus on a portfolio of each of these factors. This three factor approach can be applied consistently across each of these asset classes. We could easily add a fourth factor, volatility, that has often been used to describe returns, but to keep things simple we will focus on what could be called the big three. Clearly, carry is an important part of any FX decisions because of the deep relationship between prices and interest rate differentials. Most of the FX research shows that the change in price of currencies over time can be effectively explained through buying the high rate currency and selling the low rate which will give the investors the rate differential as a carry. Similarly the carry component in commodities is determined by whether the market is in backwardation or contango. The investor should buy the futures for those markets markets in backwardation and pick-up the gains as price to cash levels. For markets in contango, the investor should be a seller, no different than a FX trader who is losing on his forward points. Both markets are driven by the strong effects of the forward curve which can serve as a headwind or a tailwind. Momentum is a key driver in the FX markets. The trend will take place because there will be long-term imbalances in supply and demand that will cause prices to move in one direction for extended periods. If one country is following a expansionary monetary policy versus other who are engaged in tighter policies, there will be a consistent depreciation trend. In the commodities markets, there can be a supply or demand shocks that cannot be easily adjusted so there will be extended imbalances which will be associated with trends. The fact that each market is faced with significant uncertainty suggests that adjustments will be slow over time. Fundamentals and fair value will also affect the foreign exchange markets through anything from the terms of trade to growth shocks. Expectations of future changes in fundamentals will have an impact on currency prices. In commodities, supply and demand shocks will cause prices to be out of balance and lead to price changes. The current decline in demand and its impact on price is a perfect example in the commodity markets. The expected change in Fed policy has had a strong impact on dollar gains relative to the euro and yen. This could all be viewed as coming from a supply and demand imbalance. We can also add that changes in policy will have an impact on both markets and the flow of trade across countries will also be a clear driver for both commodities and currencies. One framework across two asset classes is a simple but effective means of looking at these markets. When do you have the big moves in stocks and bonds in the US? If you think they are surrounding macroeconomic announcements, you would be wrong. The focus of both stocks and bonds are during the pre-announcement period of the Fed, the day before the FOMC meetings. In fact, most of the move in stocks in for the last few years has been during the pre-announcement period. The market receives excess returns before any announcement. This has been going on before QE and is well-documented in a NY Fed study. For the period since 1994, Fed policy is announced after the FOMC meeting just after 2:15 EST. The impact on stocks from 1994 through march 2011 has been, on average, 49 bps. 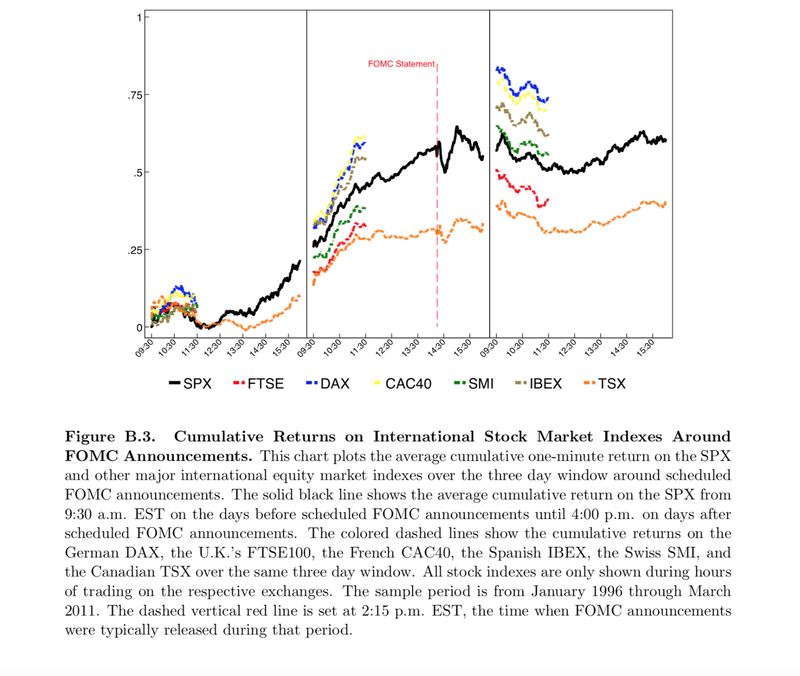 The pre-FOMC effect represents about 80% of the excess returns in US stocks during this period. This could be compensation for non-diversifiable risk of a Fed announcement. The pre-FOMC effect has also been especially strong for bonds since the Financial Crisis. 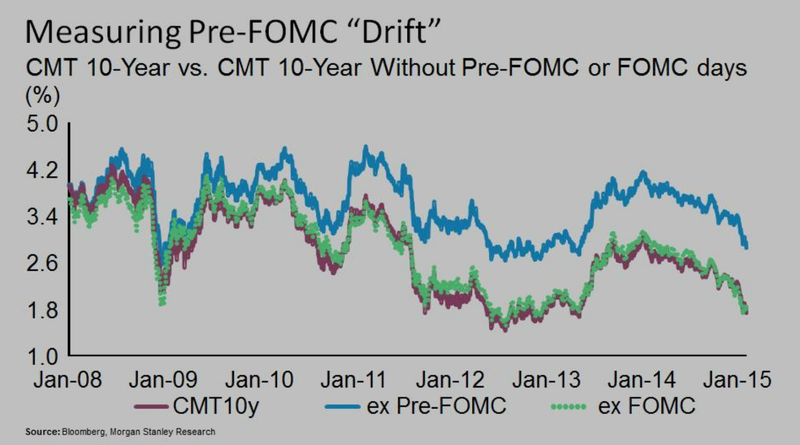 With the following charts from Morgan Stanley, we can see that most of the 10 year moves is based on what happens pre-FOMC. Take out the pre-FOMC and there is a major increase in yields. 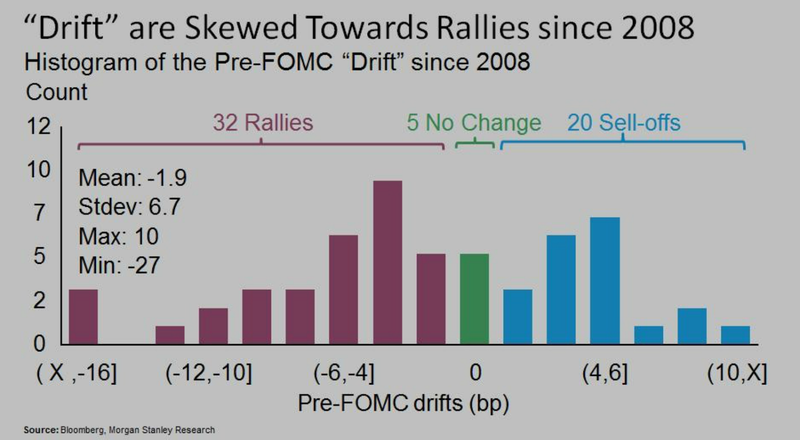 Ex-FOMC meetings and you have yields right on top of the actual series. The drift is focused on rallies or no change in a ratio of almost 2 to 1. Now this may change radically if the Fed moves to raising rates, but for the last few years, bond traders were not fighting the Fed and are just expecting more of the same in terms of loose policies. However, if this is a risk premium story, investors will still have to be compensated for the risk prior to the Fed announcement. Regardless of the story, this research just further documents the focus on the risks associated with holding any asset prior to a Fed announcement. Providing clarity through announcements has concentrated the attention of investors around these key dates. Risk and uncertainty is concentrated in ways that perhaps were not expected when the Fed said it will provide more information disclosures at announcements. The Towers Watson pension index is the ratio of the market value of assets to the project benefit obligation for a benchmark plan. It tells us the amount that is funded or covered by the pension versus its obligations. One minus the index tells us the shortfall. 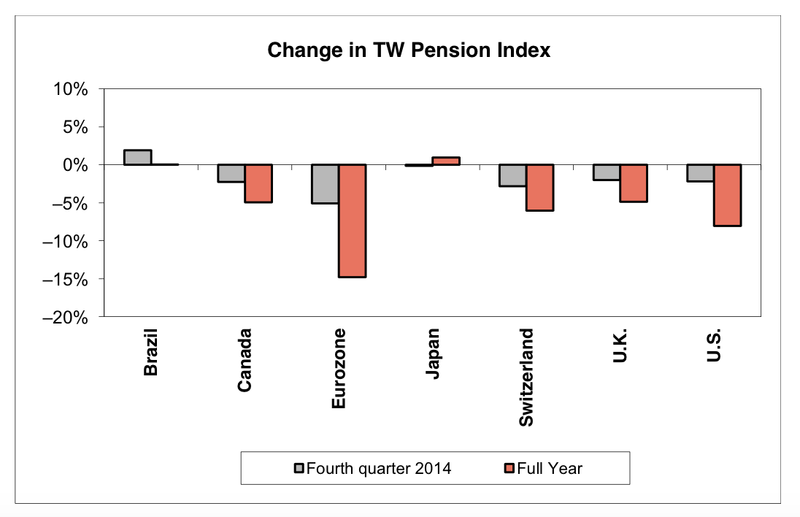 The markets had a good year in 2014 but that does not mean that pension have closed their gap against obligations. If rates fall, the current value of future obligations increases. Pensions have to add more money to cover the shortfall or get higher returns to offset the interest rate decline. Now the value of bonds increased in most portfolios but if the assets did not match the liabilities, there will be a shortfall. The decline was especially pronounced in Eurozone, but the other major countries in the survey also showed increased shortfalls. The chart for the US shows the index approaching 70% which is 10% lower than what was seen pre-crisis. Pensions need assets that can generate returns that are close to their discount rate but also provide diversification benefit. If hedge funds want to grow assets, they have to provide a solution to this problem. There is a large disconnect between QE, financial assets, and commodities. Remember that just a few years ago there was a lot of talk about the financialization of commodity markets. The correlation between commodities and financial was growing. Now we have these markets moving in different directions. The chart from Barclay's Bank is telling with how the markets have gone separate ways. 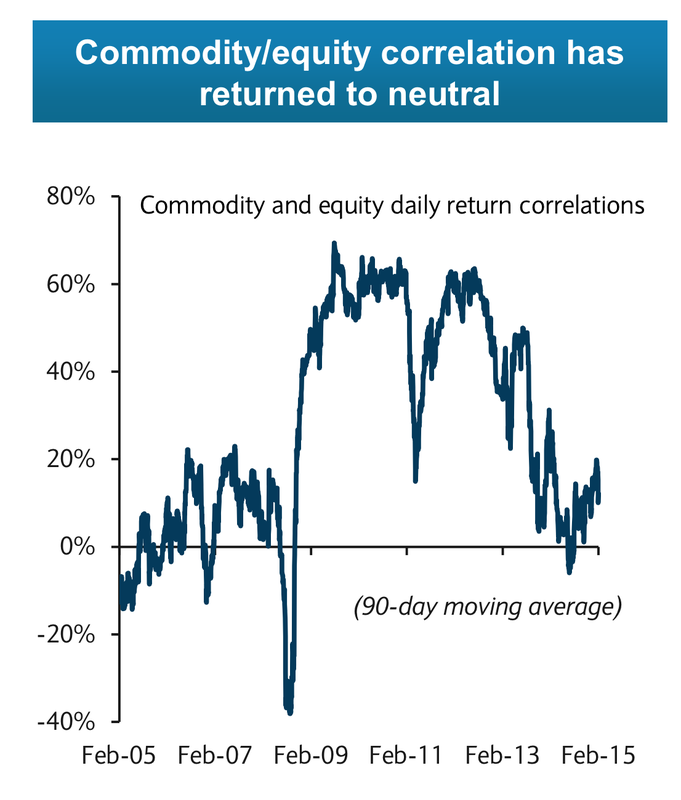 Correlation between commodity and equity daily returns have fallen from around 60% to 20%. The market is more like the pre-crisis period. 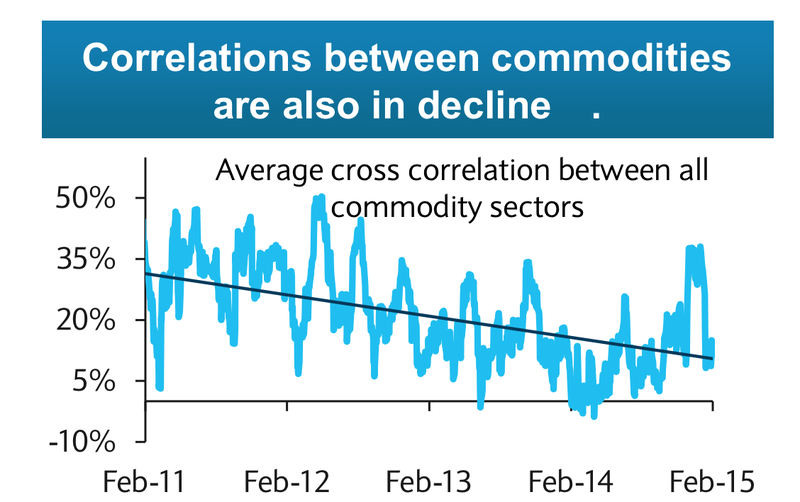 The correlation between commodity sectors have also fallen. There are a few conjecture we can make about theses markets. The single factor that used to drive both financial and commodity assets does not currently exist. 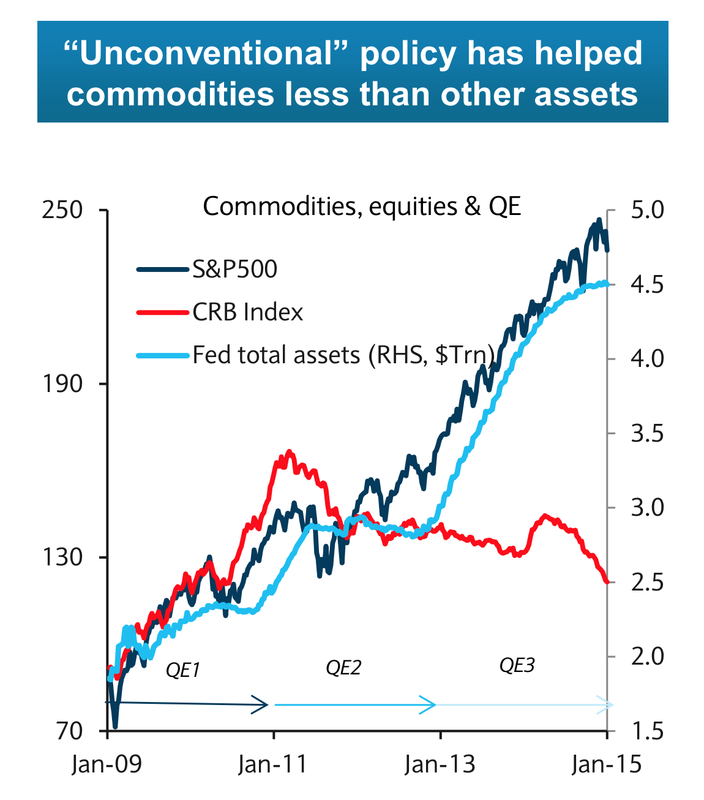 The link between commodities and QE also does not exist or is broken. The commodity markets themselves seem to be more driven by their individual supply and demand conditions. If there is a common factor that is driving commodity returns, it is world demand. The global growth rate has fallen below 4% and it seems that commodity prices march to global demand and not the money creation of the Fed. The commodity markets are more closely tied to the real economy than the financial world. What causes trading to occur? The best answer is that there is a difference in opinion on the value of an asset. Differences in opinions will cause the market to have an abundance of both buyers and sellers and lead to trading as investors balance their portfolios based on their opinions. If there is no difference in opinion, there will be limited trading because there will be agreement about the value of an asset. Trading will pick-up once there is new information that enters the market, but the adjustment will be fast if there is agreement on what the information means. Portfolio rebalancing will occur on the way to the new equilibrium price. 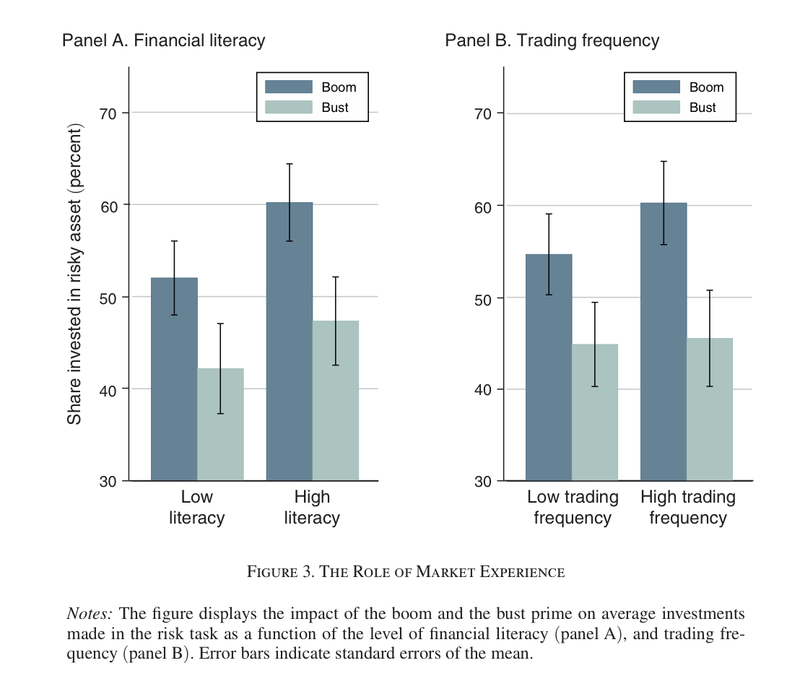 Differences in prior beliefs or differences in interpretation of new information drive trading. Li and Li from the Fed's Board of Governors study this issue in their paper, "Are Household Investors Noise Traders? Evidence from Belief Dispersion and Stock Trading Volume". Using an extensive database of consumer opinions, the authors are able to show the dispersion in beliefs about the macroeconomy by households. The dispersion is counter-cyclical. When we are in a recession there is a greater difference in opinions. 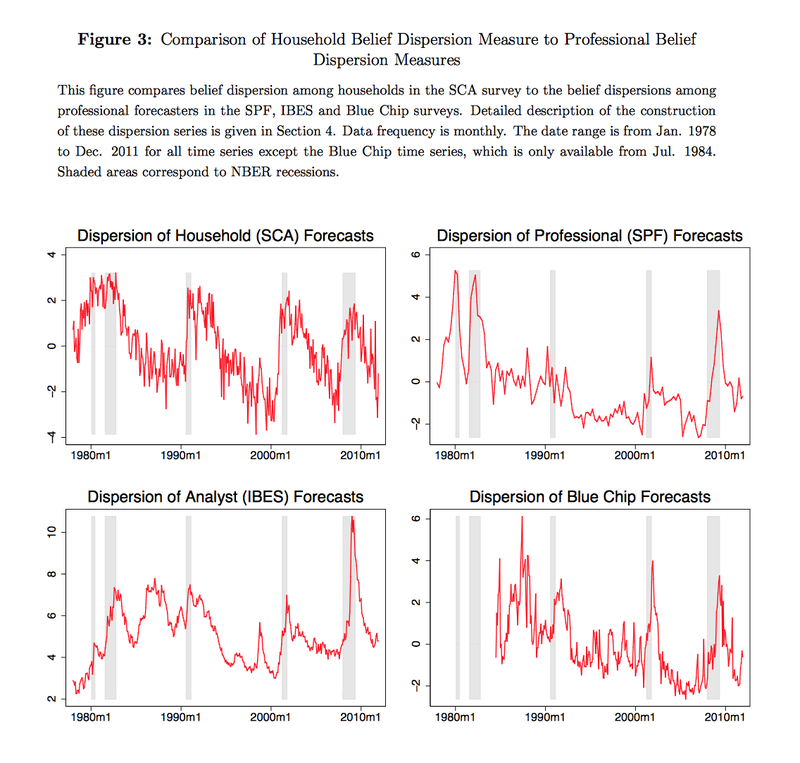 The dispersion in opinion varies with professional forecasters. The authors then find that the dispersion in opinion is correlated with more trading volume. Households act on those belief differences. This is not a new general result, but the focus on households is unique and the make up a significant portion of equity ownership. If you want to affect market expectations, it has to be focused on Main Street as well as Wall Street. Trend-following works, but that may not be a good enough reason to follow trends. There should be a strong foundation for why this strategy generates returns and the conditions when it will be effective. It may not be necessary to have these underpinnings, but it does help us understand the dynamics of an important strategy. A theoretical foundation will provide support for when trends will occur and what will be the environment for when they will not occur. A recent issue of the American Economic Review discusses the issue of market under-reaction and shows that with some very simple assumptions, you will not move immediately to the equilibrium price when trading occurs. Markets under-react which creates the environment to identify and trade trends. The foundation for this result is that if there are heterogeneous beliefs about the valuation of an asset, there will be under-reaction. If there is more divergence in opinion, there will be more under-reaction and hence momentum in price. If you cannot agree on the value of an asset, it will be harder to get there fast. Given this result, we can likely conjecture that those markets where there is greater differences in beliefs will lead to greater potential momentum. So let's see if we can classify markets based on which ones may have more dispersion in beliefs. If a market is harder to model or determine fair value, there will likely be greater belief differences. These markets will have a slow adjustment to equilibrium. If there is high volatility, which could be a simple measure of market uncertainty, there should be more under-reaction. If there is more dispersion in information about an assets, there will be greater differences in beliefs. There will be more under-reaction if there are significant changes in wealth that affect levels of risk aversion for the average and marginal investor. As beliefs are realized to be either true or false from the introduction of public information, there will be under-reaction or adjustment. My conjecture is that makes traded in a global macro portfolio are more likely to see momentum. The foreign exchange markets have all of the hallmarks of an asset class that will have strong differences in beliefs. The same applies to commodities. Equities may have less differences given that we can find arbitrage relationships with similar firms. Bonds markets also may be likely to see greater differences. The same with stock indices which are harder to value than an individual stock. As long as there are differences in opinion, there will be under-reaction and trends. If we see more uncertainty which causes greater differences in beliefs, we will see more trend behavior. There usually is the assumption by economists that risk aversion does not change through time. We can have risk aversion change with wealth, but it makes it a lot easier to assume the stability of risk aversion across different environments. Unfortunately, this assumption leads to such anomalies as the equity risk premium puzzle. New models have been developed to explain risk aversion increases during financial busts which can then be used to explain away the equity risk premium puzzle. These consumption-based habit formation models suggest that risk aversion increases as asset prices and wealth fall and we approach our long-term consumption or habit levels. Nice models, but we have limited evidence on counter-cyclical risk aversion behavior. Recent research shows that risk aversion can be counter-cyclical with the financial cycle. When faced with a boom or bust environment, many become more risk aversion if they believe that they are in a period of bust. 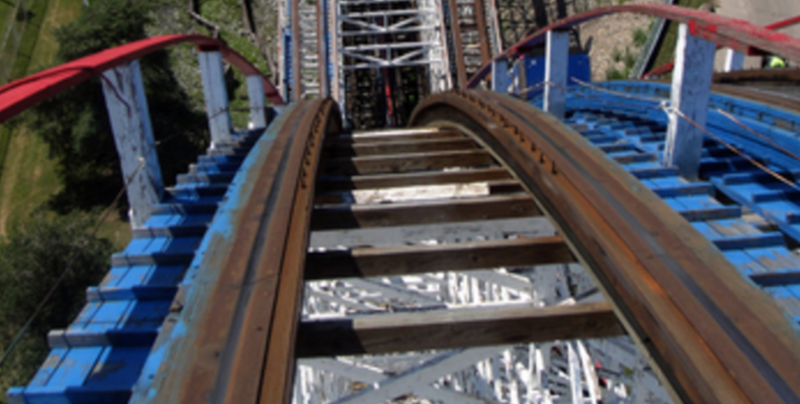 When the roller-coaster of markets take over, fear kicks in. 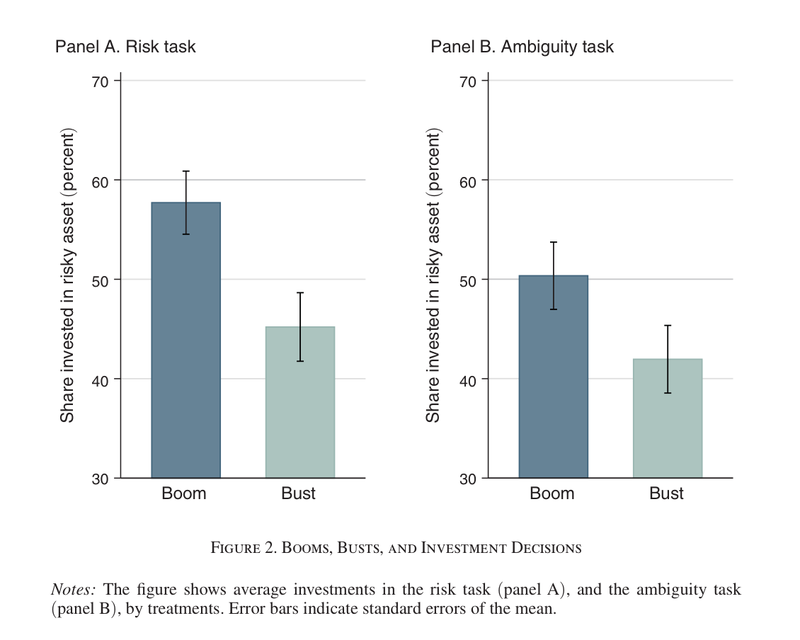 In the latest issue of the American Economic Review, researcher were able to play experiments on financial professionals and found that their behavior to risk changes with the financial environment. When one thinks he is in a market bust period, fear increases which leads to higher risk aversion. The researchers test this through setting up experimental environments. This is important because the researchers have to separate risk aversion and bust periods from expectations in a bust that asset returns are expected to decline. The simple charts from the paper show that less is invested in the risky asset if you perceive a bust period. The same applies to an increase in ambiguity. This behavior is the same for those with high and low financial literacy as well as for those with high and low trading frequency. An increase in risk aversion leads to more extreme market dynamics. When risk aversion increases, investors have to be compensated more for this risk which leads to bigger market moves. The higher level of risk aversion during market declines can explain some of the asset pricing puzzles that have been plaguing economists for a long time. It also is consistent with how we look at the world. Caution increases at market extremes. It is in our nature, so systematic models that do not embed changes in risk aversion may be able to gain an edge during these market extremes. Investors often do not focus on extreme value theory to analyze the benefits of hedge funds because extreme events just do not happen that often and the mathematics is not as easy as looking at just looking at correlation and variance. Nevertheless, building a portfolio should account for what happens at the extreme because this is when a large portion of wealth is lost. If wealth preservation is a critical issue for a money management advisor and causes more anxiety than gains for investors, understanding the dynamics at extremes is all the more important. Using extreme value theory in portfolio management is more than just looking at correlations to provide diversification. What is important is not the average correlation but what is the relationship across assets at the extreme levels and the shape of the distribution. Fat tails and skewness really matter once you move to extremes. If you add assets that have more non-normal shapes, you will change the distribution of the overall portfolio. This is consistent with our thoughts on fragile and anti-fragile strategies. Investors would like strategies that do especially well in the extreme especially relative to traditional assets. Let's take the performance of two simple assets against the stock market. They can both have a low correlation on average. However, one may get more uncorrelated on large down moves. As a diversifier, this may be a more important asset to hold all else being equal. These differences occur because the return profile of many strategies are not normally distributed. Kurtosis is surprise risk in the sense that you may not know whether there will be big up or down move. You do know that a big move is more likely than what will happen with a normal distribution. Skew is a tilt or non-linear risk. It places more tilt in the probabilities of a distribution to one side of the mean. Returns will be pushed in one direction relative to a normal distribution. Using the distribution properties of the strategies can help with determining the behavior of a portfolio in the extreme. Simulations can be run which account for behavior when there is a strong stock move. Some older work from two FoF managers provides some good insights on this matter. In the extreme, distributions matter. Whether you have fat tails and skewness have a large effect when you move to the extremes, so hedge funds which are less normally distributed will have an impact on the extreme value of any portfolio. An analysis of stock and bond portfolios which have the addition of different types of hedge fund portfolios from conservative to defensive show the value at the extreme. The benefit to a stock portfolio will be greater than for a bond portfolio. For a stock portfolio, the benefit of hedge is as great as the amount that can be held. For bond portfolios, a 50/50 mix with hedge funds proves to be the best at reducing risk at the extreme. If you have a mixed portfolio, the amount of hedge funds to be added is less clear since you get some natural diversification with the safe bond asset. 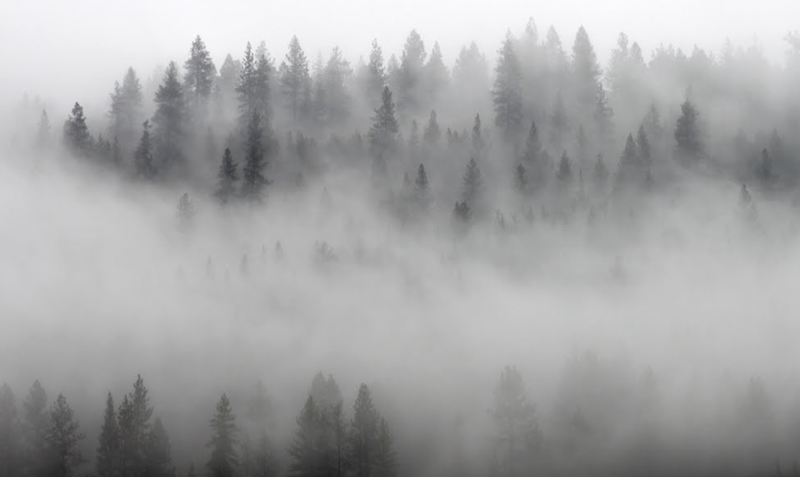 What is clear is that managed futures will provide the most benefit for portfolios at the extreme given its independence with traditional assets at the extreme and its unique distribution qualities. You may not always be happy with managed futures when the world is calm, but when divergences and dislocations occur, the behavior of managed futures is valuable. 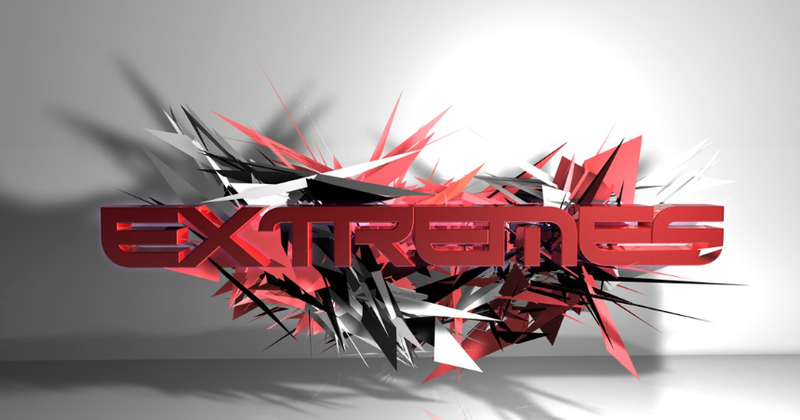 Protect your portfolio by playing the extremes. We know that Wall Street is focused on inflation expectations, but what about Main Street? Business inflation expectations as well as the views of consumers may have a greater impact on aggregate demand because these are the groups that are making current purchase versus holding off based on the idea that prices may be cheaper. We do have some evidence on business inflation expectations, but it reinforces that story the low inflation will continue to be a problem. The Atlanta Fed inflation survey shows a decline in inflation expectations and with the uncertainty concerning inflation. Unit costs are also expected to decline. Sales and profit margins are expected to improve albeit they are still weak as measured by the Atlanta Fed's diffusion index. Longer-term inflation is still higher at 2.6 percent but is also headed lower. The survey also asked whether businesses are influenced by the CPI index. 55% say that it has little or no influence on their business decisions. First, it was the crisis and liquidity that was the focus of the Fed. Second, it was growth and labor markets that the Fed's focus. Now, it is inflation that is the core issue that is a concern for the Fed. There does not seem to be a strong desire to raise rates. Put differently, patience is a virtue. Inflation can be broken into two parts, those prices that are sticky and those that are flexible. Inflation as measured by the indices will have a permanent and temporary effect. If we can decompose these two components we can have a better idea where inflation may be heading. Put another way more precisely, the CPI is a combination of prices that change frequently, flexible, and those that change infrequently, sticky. An example of flexible prices will be gasoline and heating oil. which have been changing quickly for consumers. Hence, when we get the latest CPI reading, it will be driven in the short-run by those prices that are flexible. It is important to understand the driver for inflation since it is such a critical factor in policy right now. 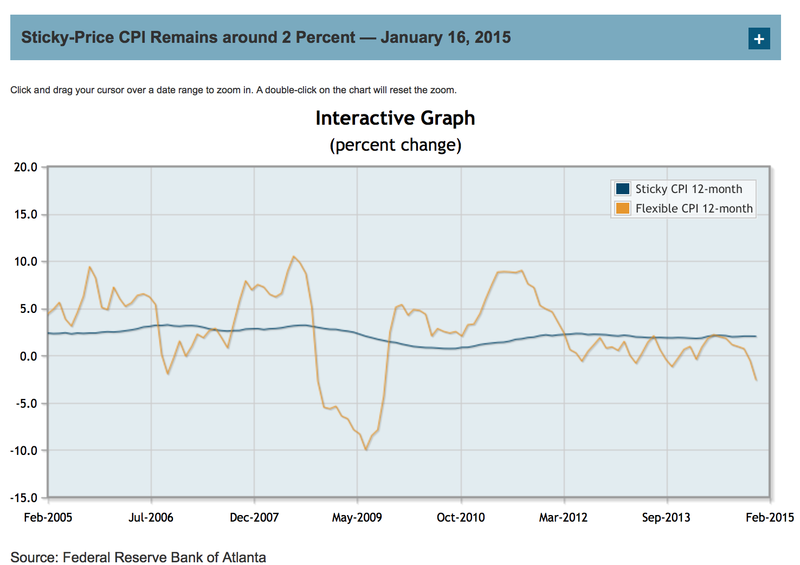 The Atlanta Fed has a inflation project that provides useful information on this critical topic. The Fed should not want to drive policy on temporary price shocks. It should be focused on the longer-term shocks. From the chart above, we can see that the sticky prices will follow the flexible prices, albeit slowly. When flexible prices fell almost 10% in the Great Recession, there was a slow or delayed but clear reaction with the sticky prices. It is notable that the flexible prices moved to positive territory very quickly. Today, we are facing flexible prices which have turned negative after almost two years below the sticky index and close to zero. The sticky prices have been somewhat stable but if the flexible trend continues we should expect that overall inflation should continue to move away from the 2% Fed target. This is the chief concern of the Fed at this time, will flexible prices rise soon and will sticky prices not decline. Correlation tells the story of what has happened to diversified portfolios in the last few months. The correlation between stocks and bonds has moved from close to zero to a strong negative. The most negative in the last few years. The bond market has actually been doing well year to date until this week. It was clearly telling us that there was a potential slowdown in growth or at least a further decline in inflation expectations. The dollar/stock relationship has increase significantly and is at all time highs for last three years. The gold/stock correlation has also fallen from positive to negative levels and is consistent with the bond move which suggests this is related to inflation expectations. The VIX/stock correlation has not changed and is the only stable relationship. These extremes are not good for diversified investors because they are unlikely to continue which means a reversal in asset class trends.The chart is from the new NYU Stern School Volatility Center (VLAB). The changes in correlation especially for stock/bonds means that returns for long-only diversified portfolios will be relatively stable and will be bracketed by stock and bond returns. This suggests that GTAA and global macro managers will likely have relatively stable returns. While the focus in January has been on the new QE program from the ECB, the more important issue facing financial markets is the race to zero rates around the world. This race is more than just from QE but from old fashioned rate cutting in order to make saving less attractive to domestic consumers and country investment through short-term capital flow less interesting to foreign investors. No thanks, we do to want you to save. Sorry, we are not looking for foreign capital inflows. When this policy of cutting rates is pursued by all countries, the race to zero and beyond becomes the policy of the day. Is this lose-lose as some have called it? Clearly, pushing rates to zero will lead to misallocations in lending. There is no competitive advantage when every rate cut is matched by other countries. The impact on any one country if the relationship across rates stays is ambiguous. What is not ambiguous is the distortion in lending markets. 22/26 central banks have had their last rate move to a lower level. 8/26 central banks have changed rates so far this year and 7/8 were lowered them. The only bank to raise rates has been the central bank of Brazil which is facing much higher inflation. Denmark and Switzerland have central bank rates negative and have negative rates for years out the curve. While the US has stopped QE and has discussed raising rates, the date is still unclear. The question is who will be the winner on the race to zero. Countries often think about export policy and the overall balance of payments in the context of economic growth. The US, however, has to realize that its greatest export may be monetary policy. 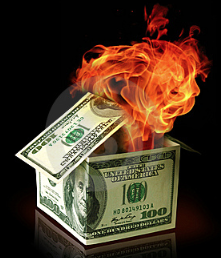 As a reserve currency the actions of the Fed will spill over to other countries. When policies are loose, we export growth and potential inflation. When policies are tight, there is the potential for a growth slowdown. The reason is simple. Even in a flexible exchange rate system, the action of the reserve currency will have spill-over to other countries. This is especially the case when the "importers" are small relative to the US. If nothing is done, market forces will cause dollar behavior to impact other countries. Countries have to offset or mitigate the impact of dollar moves. A new paper by Sebastian Edwards on the independence of monetary policy for those countries that have flexible exchange rates focuses on this issue. He focuses on examples in Latin America. Countries with flexible exchange rates should be able to pursue independent monetary policy, but many are not as independent as theory would suggest when there is a large size differential. Monetary independence may be an illusion for emerging market countries. It seemed like we were going to see more monetary policy diversification in 2015 with the Fed starting to raise rates, but now the more likely scenario is monetary policy correlation. This is not coordination in the normal sense of central banks working together, but rather actions by central banks to ensure that other countries do to have an exchange rate advantage. Calling it currency wars assumes a sense of aggressive reaction and discussion. This currency war is for most central banks undeclared. No one is having a press conference to declare an enemy or specific actions against another country. We just have to infer actions and reactions as policies change. The ECB has announced its QE plans and the euro continues its slide versus other currencies. For those on the periphery of the euro-zone, action has to be taken. For the SNB, the currency cap was eliminated. For Denmark, there was the announcement of no new government bonds. Eastern Europe, Sweden, and Norway are all effected by this latest action and have to respond. The BOE will also have to think about a next move. Japan has been pushing QE with an explosive BOJ balance sheet, but now German rates are below Japan. The Japanese currency has declined but the intended effects have not kicked in to the level expected. Nevertheless, the impact on other Asia economies is growing. Emerging markets are generally biased to offset Fed policies. This is not going to change in 2015. China has been targeting monetary programs to increase credit availability. The PBOC cannot have the yuan move in lock-step with the dollar. It is now at the upper end of its widened band. The US is the outlier with the end of the QE program and discussion of rate increases mid-year. This may be less likely as further easing around the rest of the globe continues. The hedge industry has gotten bigger, but profits are expected to decline on increased competition and the push by institutions for lower fees. 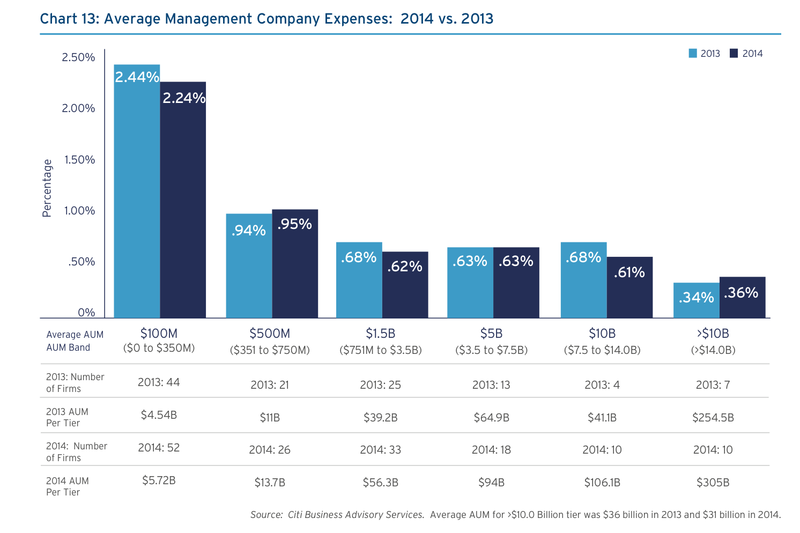 Citibank conducted their annual survey of hedge funds and found that average fees were down and expenses were up over the last year. The net has been a tough year for hedge funds especially smaller managers. 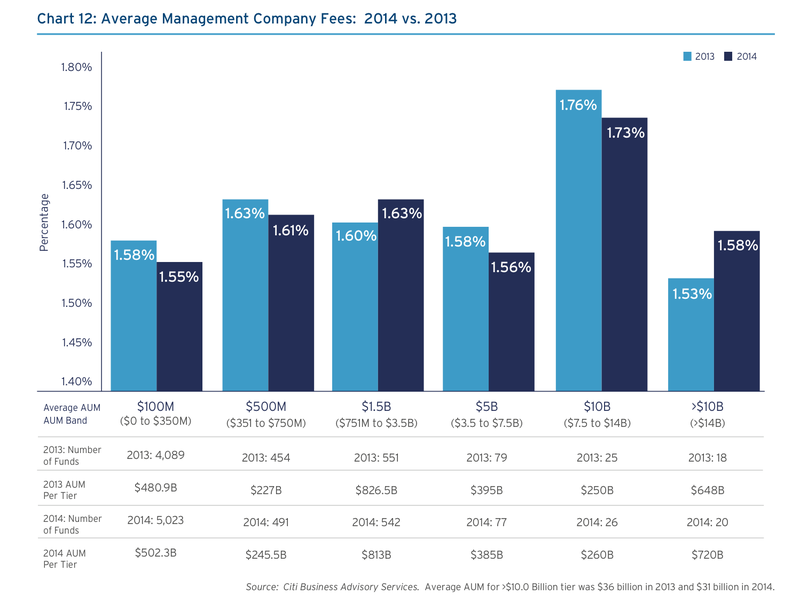 Large hedge funds were able to increase management fees and control costs. The survey clearly shows the economy of scale in the industry. 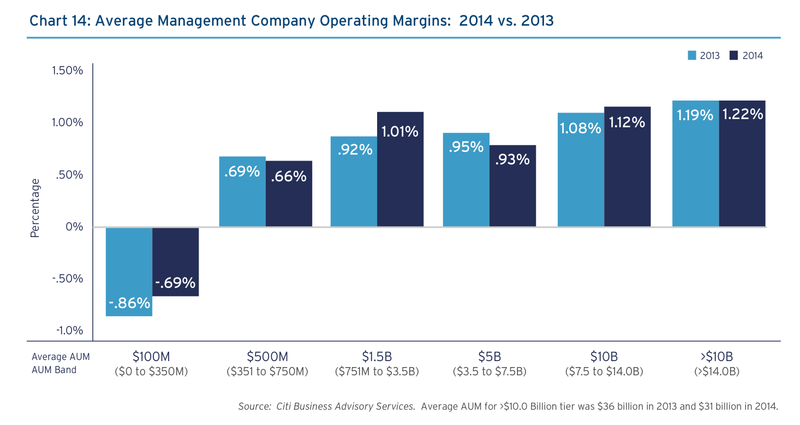 If incentive fees are not hit for small firm, the economics are not attractive. JP Morgan released the results from its annual investor survey of hedge fund investors this week. 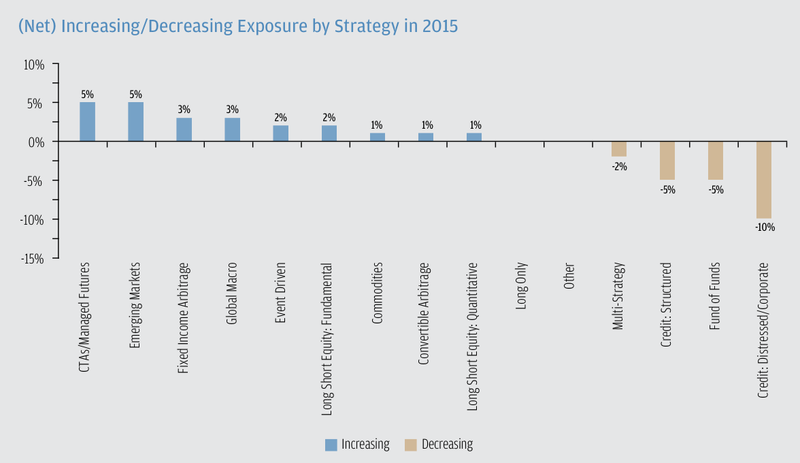 It provides a good overview of what strategies investors liked and disliked as well as their expectations for 2015. It is always useful to compare what investors have done with what actually happened. 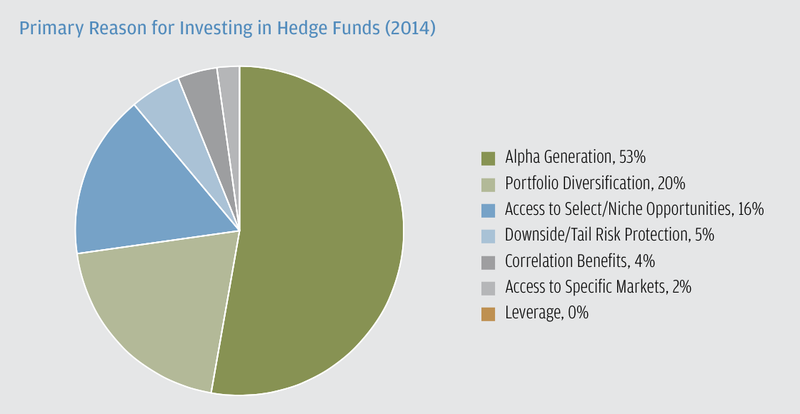 The survey suggests the main reason for investing in hedge funds is again alpha generation. It is assumed that managers have special skill and that they can exploit to generate higher returns. There may be skill, but perhaps the number two reason, diversification, is the better long-run play for investing in hedge funds. The two most important criteria beyond skill as measured by pedigree and track record is risk management and communication. The demands from investors are simple; delivery return, control the risk, and tell investor what you are doing. It is interesting that investor want the skill of an alpha generator but are afraid of the crowded trades. Show skill but do not be a copy-cat with your behavior. I find it interesting that investors want uniqueness but not too much deviation in behavior from the norm, and do not have too much conviction by taking excessive risk. 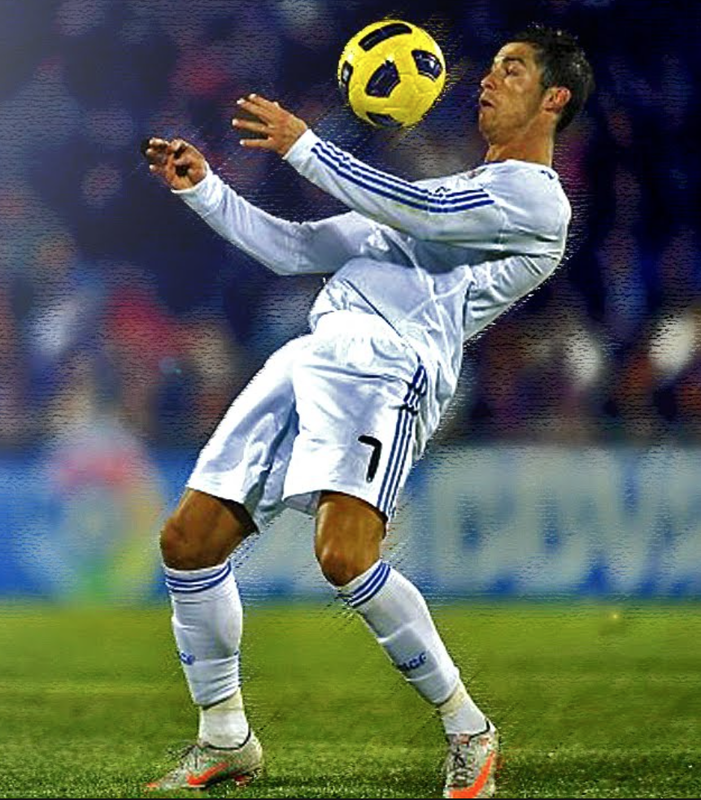 It is hard to show skill if you do not take active bets that are bigger than average. 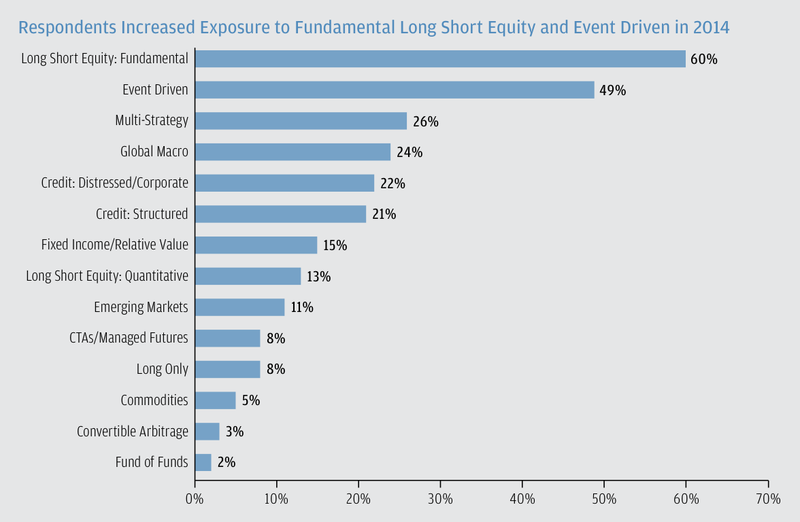 Most investors increased exposure to long/short equity fundamental managers last year. Although hedge funds are supposed to serve as alternatives to traditional assets, investors have a comfort zone that is still tied to equity investing. The long/short manager will have a lower beta than the market but is supposed to make extra alpha. In a rising market, investors are likely to be disappointed by this scheme unless risk is reduced. Investors have been disappointed with global macro. 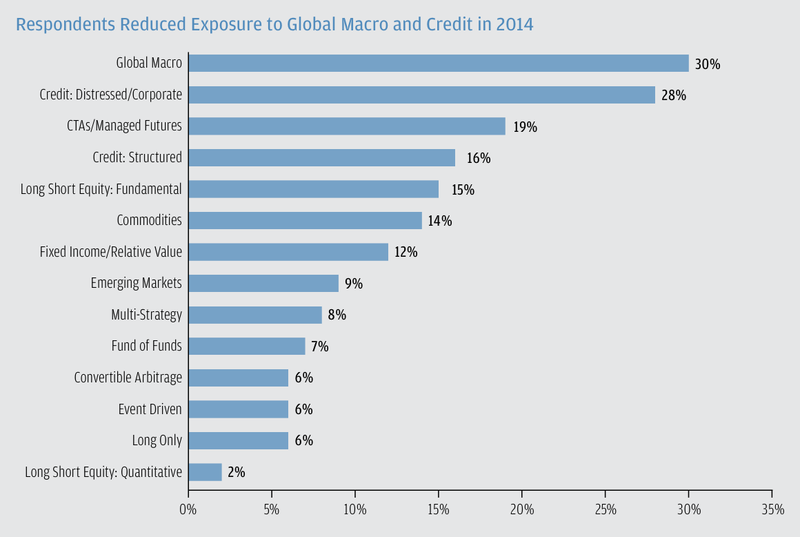 In the growing uncertainty this year, global macro was not able to deliver exceptional returns. The same has been the case with credit strategies. CTA's saw the most dramatic change in the second half of the year. The anticipated best performing strategy is consistent with where investors placed their money in 2014 - long/short equity and event driven. 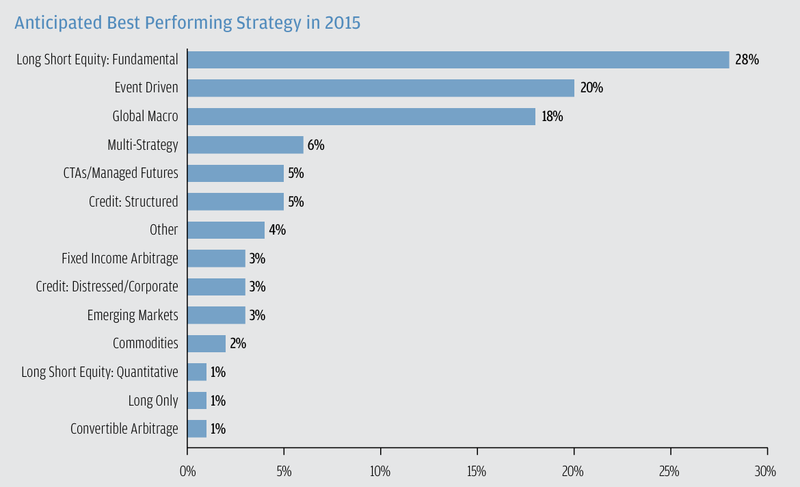 Only 9% of respondent think managed futures will do best in 2015 even after coming off a good year. 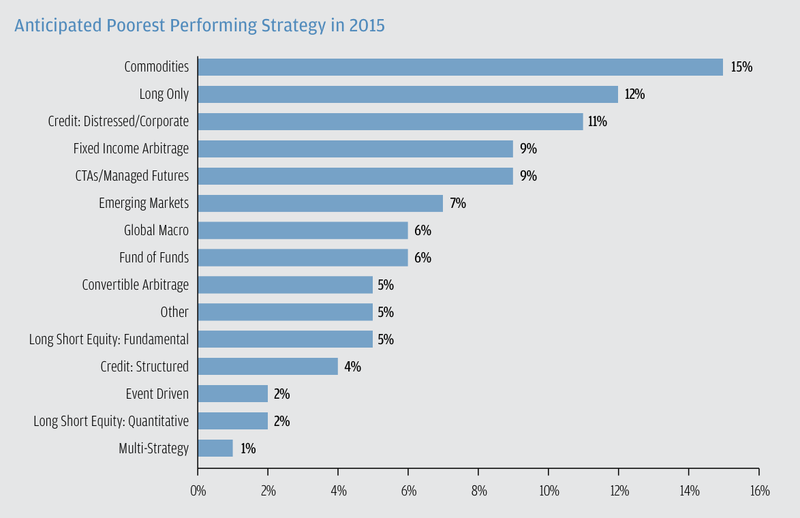 The poorest performing strategy in 2015 is suppose dot be commodity investing. Investors expect the poor trend in performance to continue. 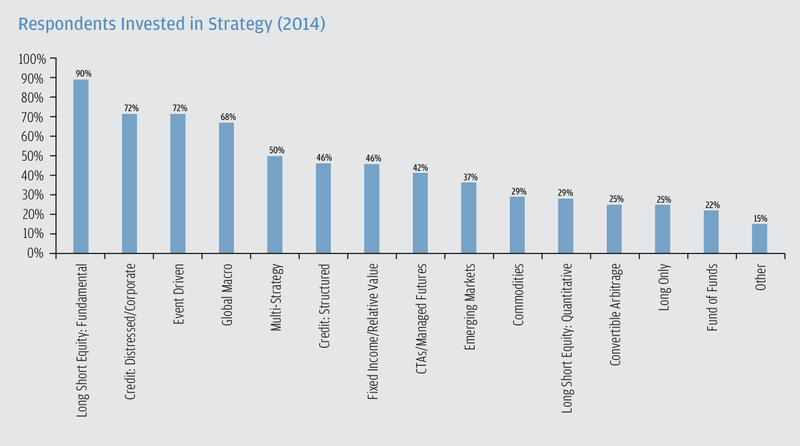 The next worst strategies include credit and fixed income arbitrage. On a directional basis, this is likely but higher volatility and changes in direction may allow the skill manager to profit. The good versus bad must be weighed and the net exposure actually shows that managed futures is supposed to see the greatest net increase in exposure for 2015. It is not considered to be the best, but investors want more exposure to this diversified strategy. This increase will come at the expense of credit strategies and fund of funds. We look forward to seeing if hedge fund investors are good at picking winners and loser for 2015. Early results suggest that they may be on to something. For those that want low cost alternative investments, hedge fund replication has been research to watch. There have been some significant analysis that has helped with hedge fund style identification, but there still has not been a way to "bottle" the behavior of hedge funds. The replication process still under-performs the hedge fund indices developed. 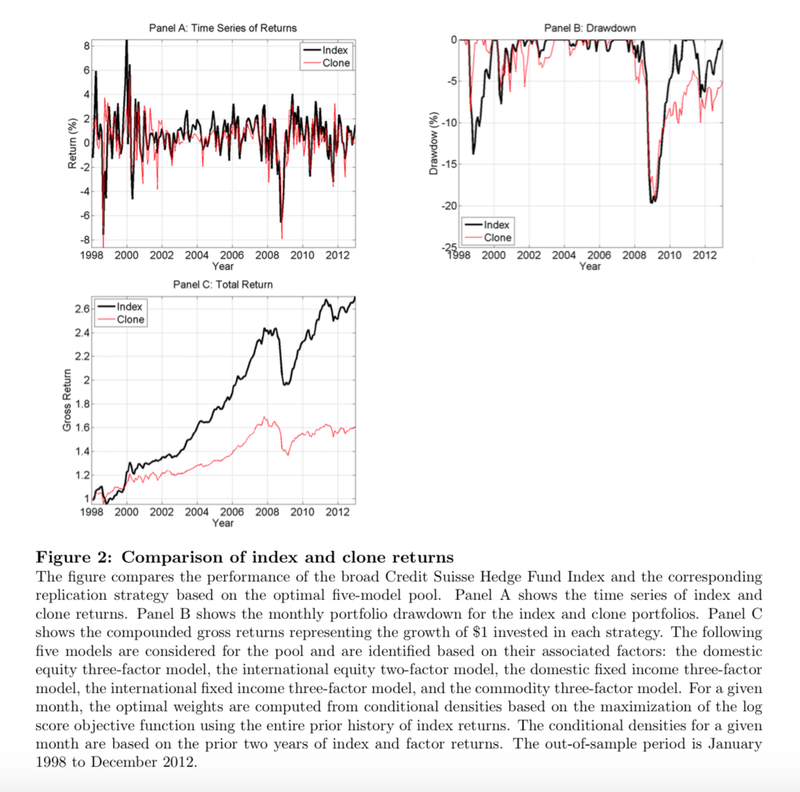 The recent paper Hedge Fund Replication: A Model Combination Approach provides an improvement over simple linear factor models for replicating hedge funds. They use a novel approach of combining models to generate optimal weights. Unfortunately, the results still show that replication is not possible. Hedge funds generate better returns. Their results table shows the underperformance even with their improved model. So what makes hedge funds unique? The factors related to a strategy can be found and provide a good first approximation. What cannot be replicated is the dynamic diversification used and the risk management employed. The alpha is in the details of active management and not the broad strategy rules. Hedge funds can change allocations faster than a model which needs past data to measure factors. The factor analysis cannot effectively replicate risk management which provides option like pay-offs. It is the dynamic switching of asset classes and factor with risk management which is the secret sauce.